We as a family are big fans of “panna cotta”. And we have gone to great lengths to eat this Italian concoction, comprising of milk, cream and sugar along with gelatin or agar agar to set it and give it that wobbly texture. Almost a decade ago, we used to drive down many miles to this particular restaurant run by an Italian chef, which happened to be the only place in town that served a vegetarian pannacotta made without gelatin. And since his antipasti, pizzas or pastas were not great, it meant us eating main course elsewhere and dessert some place else. All this now sounds like from another lifetime, before parenthood beckoned. Ofcourse this was also a time when the city was waking up to the authentic delights of cuisines from other countries. 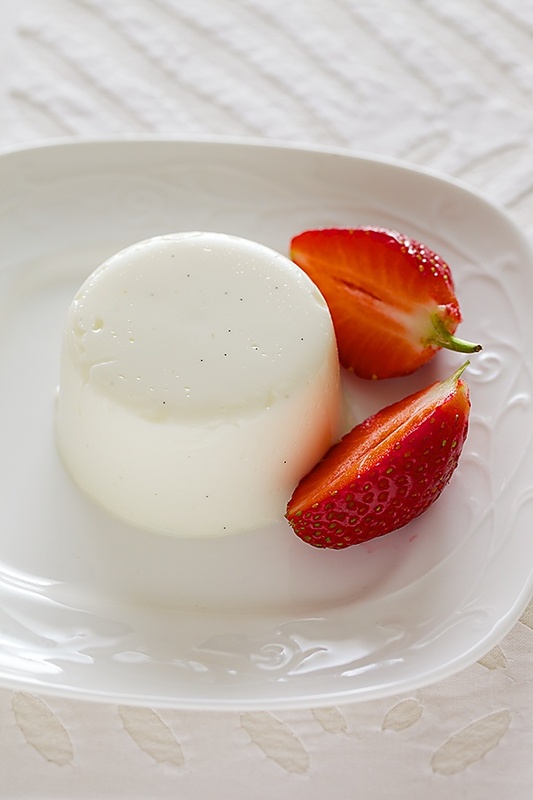 Panna cotta is now widely available everywhere and many chefs prefer to use agar agar or chinagrass instead of gelatin. It is hard to believe that a simple dessert made with such few ingredients, primarily milk, cream and sugar, can have such a profound impact on the tastebuds. Perhaps it is the simplicity itself that makes this so comforting. A breeze to make, this uncomplicated dessert can be embellished with many different fruits and enhanced with various flavourings to make it more extravagant if one prefers to present it in such a way. Since the entire landscape of the city during this season is dotted with ruby red strawberries from Mahabaleshwar (also known as land of strawberries in India), being sold by supermarkets, departmental stores, street vendors and hawkers everywhere, I decided to use this gift from mother nature to top my beautifully set panna cotta by making a coulis, which is nothing but a sauce made from pureed fruits or vegetables. So essentially this is a pairing of the Italian panna cotta with the French Coulis. But let me tell you the panna cotta would be great with other fruit toppings too or even eaten plain or maybe topped with some nutella! That said the vanilla flavoured panna cotta with the sweetened strawberry sauce are a splendid match. 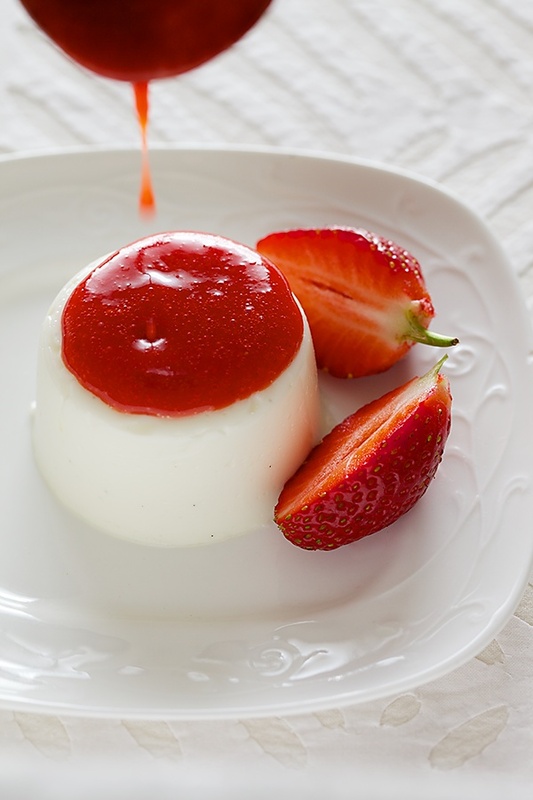 The smooth ruby red strawberry sauce topping the quivering soft set, vanilla scented base in this union of the Classic Italian "Panna Cotta" and the French "Coulis" is a beautiful match looks wise and taste wise. And I guess that should be enough to make a dessert maker happy! 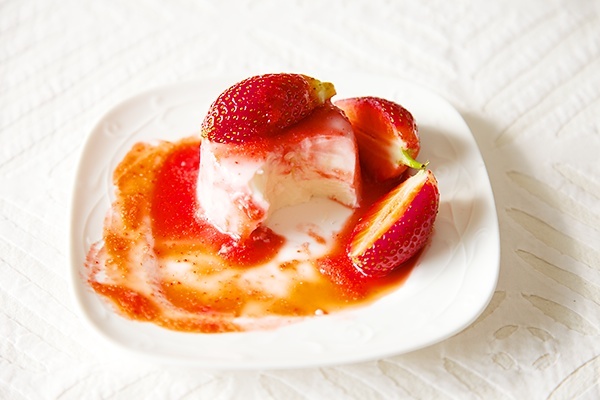 You can serve the pannacotta plain or with strawberry coulis topped over it. Other seasonal fruits can also be used to top the pannacotta. If you want a moulded pannacotta, then lightly grease ramekin moulds or any cups with a neutral flavoured vegetable oil, like rice bran oil. If using chinagrass sheets, powder it in a blender and soak in cold water for 20 to 30 minutes. In a large saucepan, mix the cream and milk together and put in the slit vanilla pod. Stir in the sugar and cook on medium low heat until the mixture comes to a boil. Turn off the heat. In another saucepan, heat the soaked chinagrass along with the water on the lowest flame, stirring continuously until the chinagrass melts completely. Stir the hot chinagrass solution over a strainer into the hot milk and cream mixture. Stir well and if you see tiny china grass particles then with a hand blender, blend at medium speed until the mixture is smooth. Pour into the greased moulds or tall glasses of your choice. Allow to cool and chill in the refrigerator for 3 to 4 hours or overnight before serving. 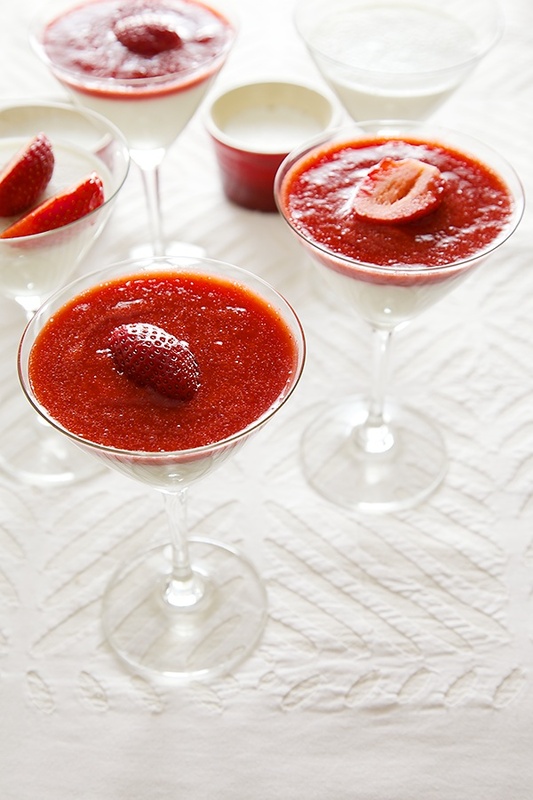 Blend the strawberry with the sugar into a puree in a blender or a food processor. Put in the lime juice and cook until the mixture comes to a boil. Allow to cool. Use 10 gm agar agar or china grass and 250 ml (1 cup) water to dissolve the china grass or agar agar for 1 liter of liquid (milk and cream together) for a soft set pannacotta. Use 15 gm agar agar or china grass and 375 ml (1 1/2 cups) water to dissolve the agar agar or china grass for a hard set pannacotta for the same quantity of liquid i.e milk and cream. Use only cream for a richer and creamier dessert. For tips using china grass or agar agar, look here. 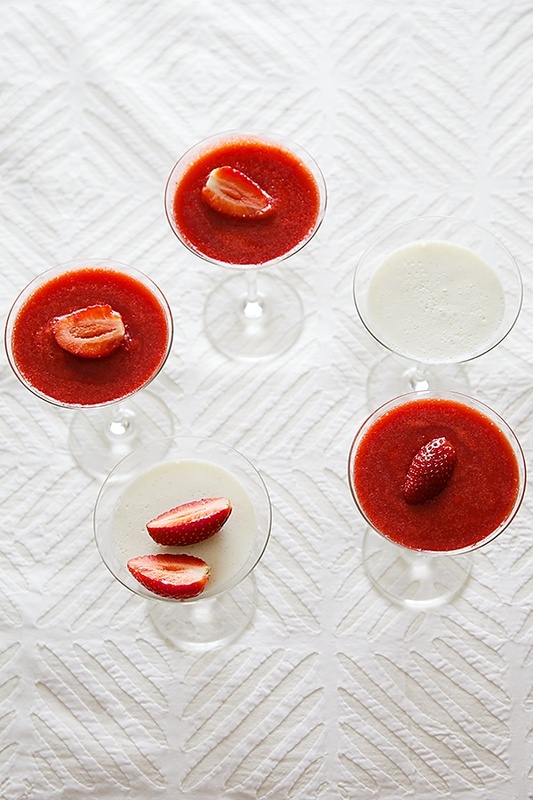 Pour the strawberry coulis over the chilled pannacotta, arrange a strawberry over it and serve. Stellar post, classic divinetaste – great pictures, delectable dessert – something I wouldn't venture into making, except you make it look breezy easy! And since I LOVE this dessert, I will take the plunge *very soon*. the pictures are making me drool. Its an easy dessert to make and delicious. Looks divine! Can you please repost ingredients? for example amount of milk and agar agar is not clear. Simi: Look forward to you trying this. Mayuri: Yes it is..the efforts are hardly any in comparison to the end result. ruchika: Thank you so much! coralcrue: No problem! I'm wearing Girl About Town from MAC with MAC beet pencil I think. Been wanting to try this ever since I had a veg. Panna Cotta topped with black currant coulis.. Simply delectable. Now that the recipe's here, making it looks like a breeze.. Like they say, the best things in the world are simple! Your pictures look gorgeous and I can't wait to try making it. I have a question though.What cream should I use for this recipe? Will heavy cream work? Or should I use the canned table cream? Anu- Yes you can use heavy cream. It will make the dessert rich, creamy and tasty. 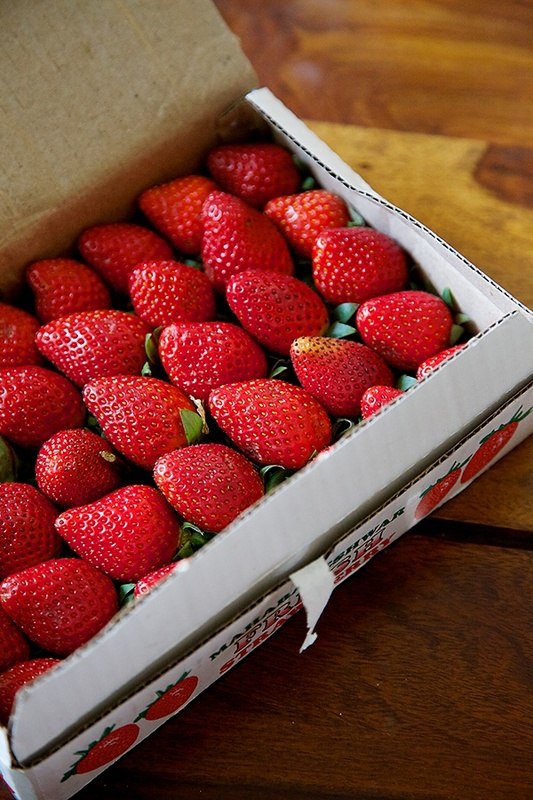 You look as beautiful, fresh and gorgeous as the strawberries! Lovely presentation and great pics as usual! The recipe looks really amazing and I can't wait to try it this weekend. Id just like to check; what would you recommend: 10gm or 15gm agar agar to get a consistency that is soft yet doesn't crumble at the same time, which is quite firm as well? Vanisha: Sorry for the delayed response. Try 10 gm please. Ronak: Thanks for your feedback, kind words and compliments. Has anyone who commented actually made this dessert with agar? I made this recipe using agar today and it turned out so firm (just with the 10gm) that I could cut it into slices and it was nothing like a panna cotta. I have had a similar problem with a different recipe which. Agar is a lot stronger than gelatin and therefore sets a lot harder. I might just do some trial and error of agar amounts. But if anyone who has tried this recipe has any suggestions for me, I'd be very appreciative. I'm a vegetarian and panna cotta is my favourite dessert, I'm finding it very disheartening not being able to replicate it in my own home. How long does this strawberry coulis keep when refrigerated? Also, any ideas on mulberry coulis – the sugar needed to balance the flavour? Thanks. Nal: If the coulis is well cooked, it should last 3 to 4 days in the refrigerator and more than a week in the freezer. Wonderful post and the recipe looks amazing. But really…Gonna try it right away…!! Can u plz tell me whether Amul Cream can be used here or is it some other variety? 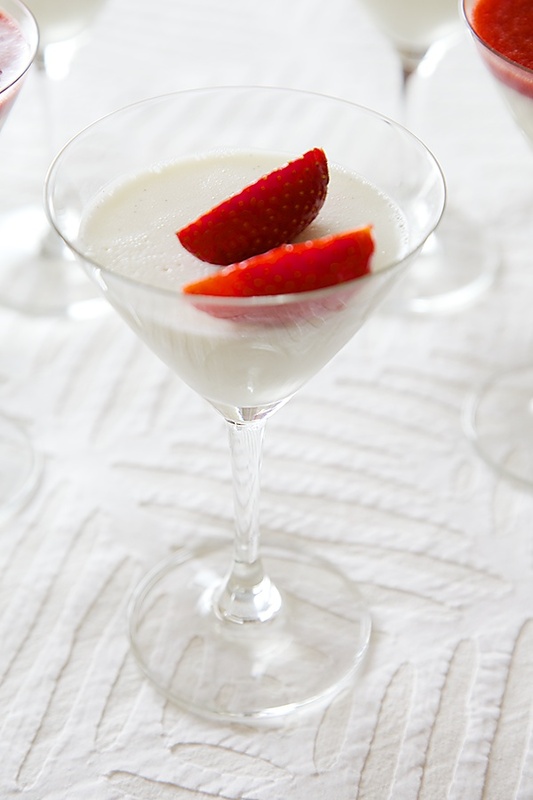 Hi Anushruti, Lovely recipe and the panacotta photos are simply stunning. Can this panacotta be made with Amul cream ??? Ambarish, Radhika: Yes you can make this with Amul cream. Tried this recipe yesterday with Amul cream. Turned out really tasty. The flavour of vanilla with strawberry coulis is simply superb and amazing. Devyani- you are right! Happy you were able to experience this amazing taste! wanna know the amount of china grass for this recipe plzzzzz…. Dee-Please refer to the end of the recipe. where can I buy agar agar in Mumbai. Most places just seem to stock the flavoured ready to cook ones…. pali- you will have to look for it in small grocery stores or kirana stores. I always like to visit ur blog n try various dishes…..recently i tried eggless marble cake from ur blog n it was a big hit..In the above recipe of Pannacotta..for 1 litre of total liquid mixtur(500 ml of milk+5oo ml cream)u have used 10 gram of china grass threads…can u pls tell me if we r using agar agar powder instead of china grass threads.. how much(in tsps) we need to use for just 500 ml of total liquid mixture…that is(250 ml of milk+250 ml of cream)….?? Nimisha- I don't have access to agar agar powder so I cant give you an accurate measure. But, if you follow the liquid to agar agar powder ratio instructions given in the pack, I guess you'll be good to go! johannaD- Agar agar and china grass are the same. Dilekha- It is mentioned in the recipe.